Five Sudanese Christians arrested, but later released, last Sunday (22 October) have now been charged with causing sound pollution through overly loud church services. The five church leaders – Ayouba Telyan, Abdelbagi Tutu, Ali El Hakim, Ambarator Hamad and Haibil Ibrahim – were summoned to court yesterday morning (26 October), but immediately told their hearing was to be postponed until next Tuesday (31 October). On Monday (23 October), the chairman of Sudan’s main opposition National Umma Party, Sadiq al-Mahdi, said their arrests were “an attack on religious freedoms that may lead to a sectarian strife in the country”. A former Sudanese Prime Minister, he returned to Sudan from Egypt in January, vowing to “to stop war, achieve peace and set up democracy and restitution of rights” and to “work to fight Islamic extremist groups and revive moderate Islam”. Christians wonder whether the easing of sanctions will prompt the Sudanese government to be more open to finally releasing a consignment of Bibles held in Port Sudan for at least two years. 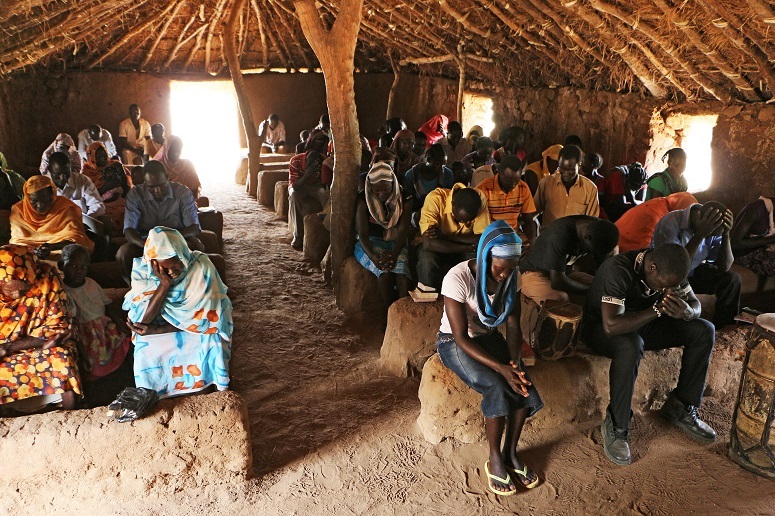 A senior church leader told World Watch Monitor yesterday (26 October) the Bible Society has not had Bibles to distribute in Sudan since around 2013. Meanwhile, a verdict is expected on Monday (30 October) in the case of another church denomination, the Sudan Presbyterian Evangelical Church (SPEC), which has been fighting for its right to choose its own chairman. Rafat Samir, who was appointed chair of the Council in 2012, is accused by his predecessor of trespassing, criminal possession and illegally impersonating the chair of the Council, a role his predecessor, Hamad Muhammad Salah, claims still belongs to him. Salah was dismissed from the role in 2012 for fraud, but the government reinstated him, even though it had no legal authority to do so. Since his reinstatement, Salah has sold off church property to businessmen with links to the government, even though last year an administrative court in Sudan ruled that Samir, not Salah, is the legal chair of the Council. The five Christians arrested on Sunday all belong to the Sudanese Church of Christ (SCOC), which has come under repeated pressure from the Sudanese government. On 22 September SCOC senior leader Mahjoub Abotrin was detained and interrogated after being arrested at his home in Omdurman, near Khartoum. It is thought he was released without charge after refusing the police demand. On 2 September four members of SCOC’s senior leadership team (again, apparently including President/Moderator Ayoub Mattan, plus Head of Missions Kuwa Shamal, Abdelbagi Tutu and Jemin Hassan) were told by the security forces to expect charges to be brought against them after they refused to hand over the Church’s office premises to a committee of government officials. In May, before this latest clash with the authorities, the SCOC risked writing an open letter of protest to the Sudanese government about what it called “the systematic violation of Christian religious freedoms”. The letter from the Church denomination, which represents about 220,000 of Sudan’s one million Christians in over a thousand congregations, was distributed over social media and detailed the “hard conditions” it had faced in recent years. It specifically mentioned the confiscation of Church properties, as well as the demolition of churches, government failure to allocate land for construction of any new churches, and travel restrictions on senior church leaders. The SCOC letter called on national, regional and international human rights institutions to intervene on behalf of the Church in Sudan to ensure an end to the violations. The EU Special Envoy for Freedom of Religion or Belief, Ján Figeľ, raised the issue of church demolitions in March during a visit to Sudan and was told some of the demolitions had been temporarily stopped. The SCOC is not the only Church to face intimidation by the Sudanese government. In June, 25 churches from other denominations, including Catholic, Coptic Orthodox, the Sudan Presbyterian Evangelical, and Pentecostal churches, as well as the Jehovah’s Witnesses, were designated for demolition. The Sudanese authorities claimed they violated designated purposes for these plots of land. The SCOC’s current leadership term ends in March 2018 when the Church’s general assembly will appoint new leaders.